Buenos Aires may be the capital of Argentina, but the hub of its wine business lies nearly 750 miles to the west in Mendoza. Dominated to spectacular effect by the Andes, this bustling provincial city owes its very existence to the mountains. Without snowmelt for irrigation water, there would be no wine industry, or agriculture, in these near desert conditions. And without the wine industry, Mendoza would be a dusty backwater. The first time I went to Mendoza, in 1993, local winemakers were just beginning to talk about a new, or rather rediscovered, region an hour’s drive to the south west, in the foothills of the Andes. The focus was still very much on traditional areas close to the city, such as Luján de Cuyo and the sun-baked flatlands of East Mendoza, but the Uco Valley was seen, even then, as a place of great potential. There had been vineyards here at least since the 1920s, planted by intrepid Italian and Spanish immigrants whose old vines are much prized today, but the Uco Valley was considered too far from the consumers and production facilities of Mendoza to be truly viable. Traditionally, Uco Valley grapes were used to add colour and acidity to those from warmer areas, but rarely featured on labels, or in consumers’ minds, in their own right. When the Argentine government offered an incentive in the early 1970s to plant in hotter East Mendoza, prompting a boom in high-yielding, poor quality Criolla, the more isolated Uco Valley, where flood irrigation was impossible because of topography, went into decline. By the mid-1990s, when the modern boom began, the area under vine had dropped from 18,000ha at its high point to 6,000ha, as growers pulled out Malbec and planted tomatoes instead. Eighty per cent of the vines in La Consulta disappeared within a decade. Fast forward 20 years and “Uco Valley wine country” is being talked about as the new Napa Valley (in terms of tourist appeal rather than wines), complete with lifestyle second homes and its own golf course. Just recently, O Fournier, a Spanish-owned winery in El Cepillo at the southern end of the valley, started selling vineyard plots to investors at US$150,000 per hectare. The spiraling price of land is directly related to the quality of the area’s wines. In a short space of time, the Uco Valley has become the most exciting wine region in Argentina and one of the most talked about in the southern hemisphere. It makes the country’s best Chardonnays and Sauvignon Blancs and many of its leading red blends. More to the point, it has added a new dimension to Argentinian Malbec, producing high altitude wines that, at their best, display intense colour and perfume, as well as fresh acidity, dense black fruits and succulent tannins. But let’s back up for a second and look at the lie of the land. For even though the Uco Valley is generally considered as a single entity it is far from homogenous. The valley runs north to south and is 70km long and 40km wide. To the south, it is bounded by desert, although cold winds come up from as far away as Patagonia, and to the north by hills or “cerillos” at 1,400m or higher. The east of the valley runs into a series of gorges and dry riverbeds. The Uco Valley is crossed by two rivers, the Tunuyán and Las Tunas, which rise in the Andes and flow into one another near the town of Tunuyán. Even though this is a cool region (at least by Argentine standards), with a diurnal variation of 20°C in summer and 18C° in winter, it is mostly too hot and dry for vines to survive without irrigation, although there are some old, dry farmed vineyards. As far as growing grapes is concerned, the limiting factor is access to water. This is an agricultural valley (there’s no heavy industry here and roadside fruit stalls, groaning with brightly coloured produce are almost a feature of the landscape) and its 75,000 ha of crops, around a third of them vineyards, need it to survive. Wineries without access to the rivers have to rely on springs or sink costly wells. What strikes you most about the place when you visit is not its dryness, punctuated by green, water-fed oases of crops and trees, but the light: so bright and intense that you need sunglasses and a tube of factor 50 at nine o’clock in the morning. The air up here in the foothills of the Andes is pure but thinning. Walk up a slope in Gualtallary and you feel like you’ve been on a cross trainer. The mountains dominate the horizon to the west of the valley: massive, brooding, snow-crested peaks that seem even closer than they are, such is their size. Without the Andes, the region would be unremarkable in terms of beauty; with them, it is one of the most spectacular sites in the Americas. The area has three sub-regions. From north to south these are Tupungato, Tunuyán and San Carlos. The highest part of the valley (around 1,500m) is at the northern end, where Salentein have their Finca San Pablo, while the lowest is El Cepillo (900m) in La Consulta. The warmest vineyards tend to be situated between 1000 and 1200m, the very areas that also grow cold-sensitive peaches and cherries; above that, the temperature drops again because of altitude. The area under vine has nearly doubled in the last decade, from 12,235ha to 23,393ha. The most planted grape by far is Malbec, with 10,230ha (up from 3,166ha), but Syrah, Cabernet Franc and Sauvignon Blanc are also developing fast. Pick the right soil type and (more importantly) the right altitude and you can produce almost anything here, from delicate whites to rich reds. The roll-call of grapes includes Barbera, Bonarda, Cabernet Franc, Cabernet Sauvignon, Malbec, Merlot, Pinot Noir, Syrah, Tannat, Tempranillo, Chardonnay, Chenin, Pedro Xímenez, Sauvignon Blanc, Semillon, Torrontés, Ugni Blanc and Viognier – a classic Argentine mix of French, Italian and Spanish grapes. In the past, there were very few actual wineries in the valley – only three in the early 1990s (Rutini, Gancia and Chandon) – and a lot of small growers. Even today, many Mendoza-based producers prefer to buy grapes here and vinify them outside the valley. There are currently 76 actual wineries in the valley, of which around 20 are major concerns, but hundreds of brands. The Uco Valley is an international valley, developed by outsiders from the United States and France to Belgium and Iran. Maybe it took foreign capital and daring to develop a region that was regarded as marginal by Argentines. Whatever the explanation, most of the top producers, from O Fournier to Achaval Ferrer, Andeluna to Salentein, are foreign-owned. Of the best-known names only Catena, Zuccardi, Mendel, Rutini, Trapiche and Finca Sophenia are fully Argentine. The three foreign consultants who have done so much to shape the progress of Argentine wines – the Italian Alberto Antonini, the American Paul Hobbs and the globe-trotting Frenchman, Michel Rolland – have all got a stake in the Uco Valley, the first with his Altos La Hormigas brand, the second with Bramare and the third with Val de Flores, Mariflor and as part of the Clos de los Siete group in Tunuyan. The first two buy grapes, whereas Rolland has invested his own money, but Hobbs is in the process of acquiring his first vineyard here. The Uco Valley isn’t only about foreigners, mind you. 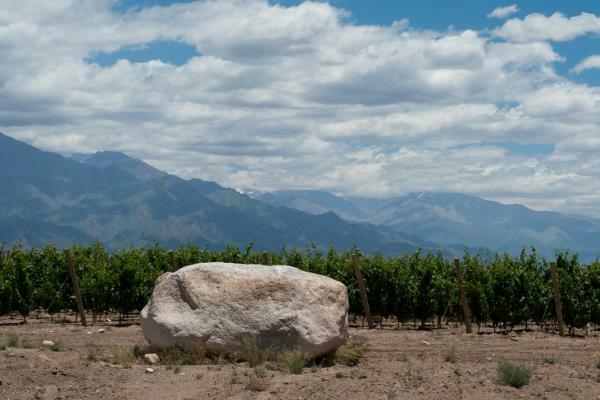 Catena stands out, not only as the leading producer in the region but in Argentina as a whole, producing high altitude Chardonnays and Malbecs of distinction from its Adrianna Vineyard in Gualtallary. To me, Catena’s Alejandro Vigil is the greatest winemaker in the country. Add the talents of Daniel Pi (Trapiche), Sebastián Zuccardi (Zuccardi), Roberto de la Mota (Mendel), José Spisso (O Fournier), Matías Michelini (Passionate Wines and Zorzal) and Marcelo Peleritti (Monteviejo) and the Uco Valley has an increasingly strong Argentine accent. The combination of all these factors – climate, investment, soils, altitude and winemaking talent – has made the Uco Valley the most thrilling wine region in Argentina. As the vines get older and grape varieties are matched more closely to specific terroirs, the quality of its wines can only improve. Argentina’s Napa Valley? You bet. That and a whole lot more. Climate: Continental. Dry and sunny (250 days a year). Main varieties: Malbec, Cabernet Franc, Merlot, Cabernet Sauvignon, Bonarda, Pinot Noir, Chardonnay, Sauvignon Blanc, Pinot Gris. Leading wineries: Achaval Ferrer, Andeluna, Bramare, Catena, Clos de los Siete, Cuvelier de los Andes, Diamandes, Doña Paula, Finca Sophenia, François Lurton, Lindaflor, Manos Negras, Masi Tupungato, Mendel, Monteviejo, O Fournier, Passionate Wines, Piattelli, Riglos, Rutini, Salentein, Trapiche, Val de Flores, Zorzal, Zuccardi. An intense, high altitude Chardonnay that wouldn’t look out of place in Puligny-Montrachet: mealy, minerally and subtly oaked. A wine that shows what a great future Cabernet Franc has in the valley, this is wonderfully perfumed, with grassy, green pepper notes and very fine tannins. The best of the range of Malbecs from this high quality winery: fleshy and subtle with intense black and red fruits, subtle oak and great palate length. A blend of 50% Malbec with 40% Cabernet Sauvignon and 40% Franc, this defies its high alcohol level. Very modern, stylish and fresh with good ageing potential. Part of Trapiche’s single vineyard line, sourced from individual growers, this old vine Malbec comes from La Consulta. Dense, tannic, yet packed with flavour. A refreshing, almost Gamay-like take on Bonarda from Matías Michelini. A juicy, youthful glugger with juicy raspberry and red cherry fruit and a hint of spice.